Book one or both apartments of our fully self contained modern duplex beach house with reverse cycle air-conditioning, 100 metres from Prevelly Beach, private grassed back yard with barbeque - ideal for children and entertaining! Nearby attractions include a golf course, wineries, restaurants and galleries, Leeuwin-Naturaliste National Park and walk trails. SEAESCAPE 1: ~ Both apartments together can accomodate up to 4guests using 2bedrooms, 1toilets, and 1bathrooms. SEAESCAPE 2: ~ One apartment can accommodate up to 6 guests using 3 bedrooms, 1 bathroom, and 1 toilet. ESCAPE TO OUR TURNER BROOK COTTAGE! A gorgeous 3 bedroom cottage on Caves Road, Hamelin Bay providing secluded accommodation in a quiet, tranquil, bush setting away from neighbours. $90-$200 (depending on numbers and length of stay and season). 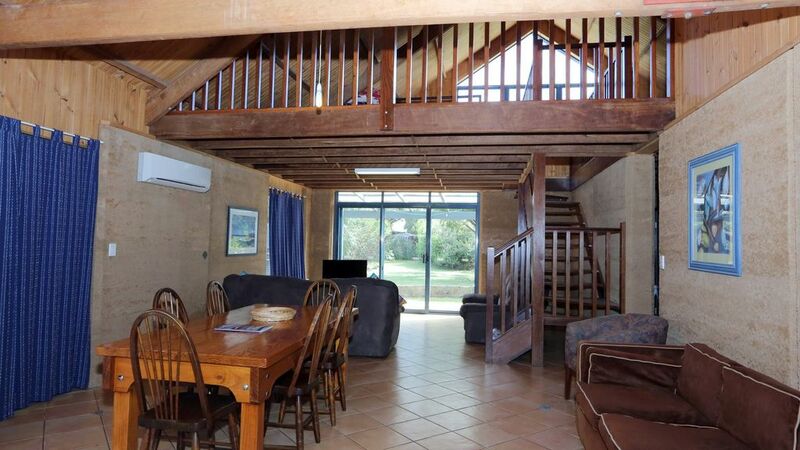 Situated on a working farm with pet cows, sheep, goats, geese, & chooks, the mud brick house sleeps up to 9 people and is warm in winter but cool in summer. The enclosed back yard is safe & ideal for dogs and children. Only seven minutes drive from Augusta, 25 minutes from Margaret River, 4 minutes from Hamelin Bay and some of the most picturesque beaches in the South West, ideal for swimming, fishing and surfing. Close to Cape to Cape walking trails, native Karri and Jarrah forests and some of the regions best wineries. Only a short drive to Jewel Cave, Lake Cave and Mammoth Cave along the magnificent Boranup Forest section of Caves Road. Ask about availability. A great place to stay in a great location. Tony was always keen to help which was appreciated. Would recommend to anyone looking for a quiet but centralised location place to stay. Very homely feel about the place, only thing is it needed removal of cobwebs on roof woiden beams. Friends and I stayed here for a long weekend, the house was well kept, warm and had everything we needed. The owners were very friendly and only a phone call away when needed. I would recommend Seaescape 2 to anyone looking to stay in Margaret River. Nice to stay did not hear the rain or wind during the night plenty of room for the kids to relax. i am satisfied with the atmosphere , room, kitchen but the heater is not warm enough.